IAMS Chewable Sticks chicken & beef 3 unit. Advantix is a treatment against fleas, ticks and mosquitoes that is applied monthly to the skin of the dog. Provides triple protection thanks to the synergistic effect of the two active ingredients, Imidacloprid and Permethrin. Advantix should be applied only once a month. Advantix has a real and proven efficacy preventing reinfestation for a period of four weeks. 4 pipettes dose blister inside an aluminum bag. Advantix comes in pipettes that apply depending on the weight of the animal. There Advantix for dogs up to 4 kg, Advantix for dogs of 4 kg to 10 kg, Advantix for dogs over 10 kg up to 25 kg and Advantix for dogs over 25 kg to 40 kg. Advantix in less than 5 minutes stops the flea bite (bite) and eliminates them before they can lay eggs. Advantix also eliminates flea larvae, before they are developed and become adult, so that it is not necessary to apply a growth inhibitor. Advantix can be used in dogs from 7 weeks of age or weighing more than 1.5 Kilos of body weight. Advantix remains effective even after bathing with water or shampoo. After repeated water baths removes 97.9 - 100% of the ticks and from 92.5 to 100% of the fleas, therefore, may even be preferred in dogs which were much like water. Advantix is safe and can be applied in pregnant and breastfeeding. Advantix has spread rapidly throughout the skin and protects an animal's body within 24 hours after application. 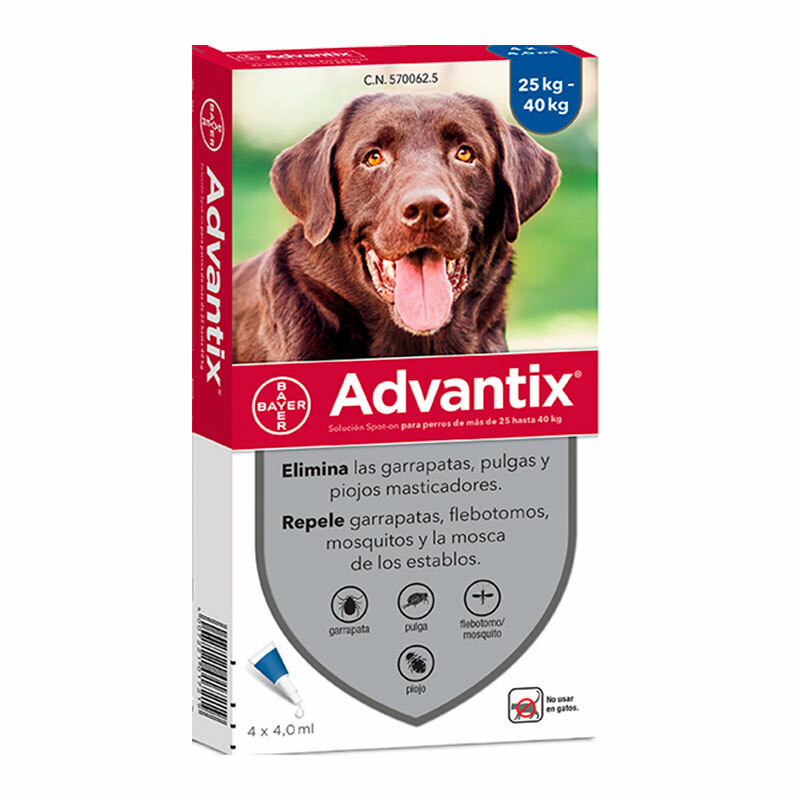 Advantix is formulated with an innovative organic excipient which allows better distribution on the skin and coat of the dog. Advantix must not be used in cats. If applied to a cat, or ingested by a cat has licked the hair of a dog recently tried this product may have serious effects on your health. Can i apply Advantix to my dog if I have also a cat at home? Studies in homes where dogs and cats live show that treatment of dogs does not cause adverse effects in cats that live with them. In the case of coexistence of cats dogs, to prevent accidental exposure of the product, keeping dogs cats separate until application site dry completely. Can i use Advantix on my dog that has Allergic Dermatis to the Flea bite? Advantix efficiency is proven in the treatment and prevention of allergic Dermatis to the flea bite. What removes parasites Advantix dog? Prevents and controls the infestation of ticks, fleas and mosquitoes in dogs also. What is the double effect of Advantix dog ticks? It has a dual purpose dog ticks, as it has a repellent effect and it eliminates them. It also has a dual effect against dog fleas by eliminating adult fleas and also removes flea larvae are in the soil. Advantix has a dual effect against mosquitoes dog because it has a repellent effect and also removes them. Today I applied Advantix my dog​​, how long I have to wait to bathe? After applying Advantix a dog, wait just 24 hours to bathe, that way does not reduce the duration of effect parasiticide. Bayer is a multinational company with key competencies in the fields of health, nutrition and high-performance materials. With our products and services we want to be useful to humanity and contribute to improve health and quality of life. Bayer's statement of principles is summarized in the slogan "Bayer: Science For A Better Life" and in the continuous improvement of our products. Its objective is the research, development, production and marketing of innovative products that improve the health of people and animals around the world. The Animal Health division of Bayer is composed of two areas, focused on the two fundamental markets of the veterinary sector: pets and production animals. The CAP (Companion Animal Products) area markets products for the prevention, care and health of pets, especially dogs and cats. The Department of FAP (Farm Animal Products) is dedicated to the commercialization of products for production animals, mainly for pigs and ruminants, and also develops biosecurity programs that reduce the activity of pathogenic organisms in farms. The commitment of this division is to offer the veterinary sector products that improve the health and quality of life of pets, as well as greater productivity in supply animals. In addition, the Animal Health division has an extensive program of corporate social responsibility actions, such as support for different programs of animal-assisted therapies, and the promotion of adoption and the fight against abandonment. These activities reinforce the social commitment of the Animal Health division, in line with Bayer's values ​​of research for a better life.